Do You Know The Warning Signs To Save A Family Members Life? There are dozens of different nut allergies that exist and each allergy requires different methods to treat it. Dont assume that your doctors will tell you if there is something wrong, you need to learn for yourself what the warning signs are, what the symptoms are and how to treat the allergy if in fact you or someone in your family has it. Severity of nut allergies range from mild irritation to anaphylactic shock. Even the most minute trace of nut-based proteins can cause symptoms. Only with understanding the allergy and treating it properly can you hope to live a normal, regular healthy life. Dont you owe it to your family to learn all you can about this allergy and make sure that if anyone starts exhibiting symptoms that you will be able to treat them immediately? Learn all there is to know about nut allergies. Start learning today. - Recognize The Symptoms Of A Nut Allergy! - Decide What You Can And Cant Eat! - Understand The Difference Between Peanut And nut Allergies - They are not The Same! - Learn What Treatment Paths Are Right For You! - Avoid Potentially Deadly Situations! - Understand How Epinephrine Works And How To Use It! Take Control Of Your Allergy Today! One of the scariest parts of taking care of a nut allergy is the knowledge that even the smallest speck of nut dust can cause potentially devastating damage. Its therefore prudent to understand that there are certain foods that you must stay away from at all costs. Even the slightest hint of nuts might send you into having an allergic reaction. You have to do everything within your power to avoid exacerbating you situation completely. Its this very reason why this book is so vital to your survival. Do you know exactly what to stay away from and what is safe? I am not just talking about food here. Oils, creams, fragrances, soaps and anything else you might come in contact with needs to be checked to make sure its safe. It is always important to educate yourself to is safe and what is harmful. Recognizing And Dealing With Nut Allergies will help you understand what you can and cant have around you. You need to learn to read and understand food packaging labels. You need to be vigilant about what shampoos you put in your hair and what hand creams you use. You need to double check your beautician, hair salon and every time you go out to eat, you need to be able to ask the right questions. Any place you go where even one trace of nut protein can get into your bloodstream you need to be aware of. 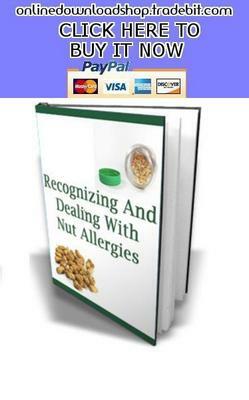 Recognizing And Dealing With Nut Allergies might just be the most important book you will ever read. No matter how much you think you know about your allergy, there is no reason to deprive yourself of this vital information. This book could save your life or the life of someone you know.